Hermit crabs are not really crabs, however. Their abdomens are smaller than real what real crabs have. They are also softer, so they live inside empty snail shells to provide protection to their body. As your pet hermit crab grows old, it will outgrow its shell so you will need to provide a new shell for it from time to time. There are two main species of hermit crabs in the US that are usually taken as pets– the Coenobita clypeatus and Coenobita compressus (Ecuadorian Crab or E-Crab). There are also other species in other countries that are also kept as pets, like the Australian land hermit crab (Coenobita variabilis), as well as the strawberry land hermit crab, which is scientifically known as Coenobita perlatus. If you are planning to have one or more of these small animals to be your next pet/s, you can easily find them in your local pet stores. However, you will need a lot of consideration when selecting a potential pet. You will need to make sure that the hermit crab that you will choose to have all of its legs (3 pairs of walking legs). It should also have a good shell that covers its head and has a thorax that is not injured or broken. Check if there are no small bugs attached to any part of the crab and make sure that your potential pet is active and alert. These unusual pets prefer to live on land and not anywhere else. They are also great escape artists, so you will need to make sure that the space that you provide for your hermit crabs is big enough for them to remain satisfied for years to come. You need to make sure that the new home that you will provide for your pet contains all the essentials that will make your pet comfortable and happy. Creating an appropriate environment for your hermit crab is essential as this will contribute to your pet’s overall health. You will need to use the correct tank, substrate or bedding, accessories, food, and water, as well as ensure that there is the right level of humidity within its housing as this will help keep your pet satisfied while under your care. Keep the humidity level within the enclosure from about 75% to 90%. Your hermit crab may be small, but it won’t last a day if it’s contained in a small container. You will need to find the right enclosure where it can roam around freely and safely. The smallest tank that you can use as its enclosure is a 10-gallon glass tank as it provides just the right amount of space for your small friend. It should also be kept well-secured with a wire mesh lid that can allow some fresh air to come in and help the humidity level to an acceptable one but won’t give your hermit crab a chance to sneak out through any possible gap. Make sure to place the enclosure in a warm place but not near the windows or where there is direct sunlight that can hit the glass as this can make the enclosure too hot. Doing so may just endanger the life of your fragile pet. Your local pet store may just have what you need for your new pet’s substrate. Your options include sand, sand and a mix of earth, and coconut fiber substrate. 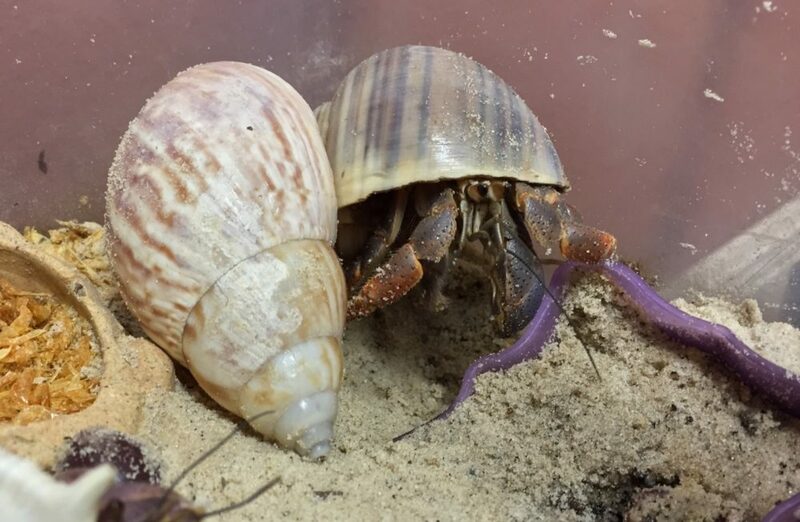 Hermit crabs love to dig around its habitat, so it will be best to choose a substrate that will allow your pet hermit crab to burrow and tunnel through the substrate. Your pet hermit crab will love to see driftwood, branches, rocks, makeshift shelters, and other decorations and accessories where it can climb on or rest in. Don’t forget to include hermit crab food and water bowls that your pet can easily use while inside its enclosure. Regular cleaning of the enclosure, as well as the accessories and substrates, is necessary to ensure your pet’s overall health and safety. You and your pet can get along quite easily but you should not take for granted the basic essentials that will keep your hermit crab happy and healthy.